What a weird sight this is, you think to yourself, wondering if the scene in front of you is real. That McLaren race car over there certainly belongs on a track, not a street. Ha! McLaren got you this time. Your silly crossover is no track car, therefore this is no track. 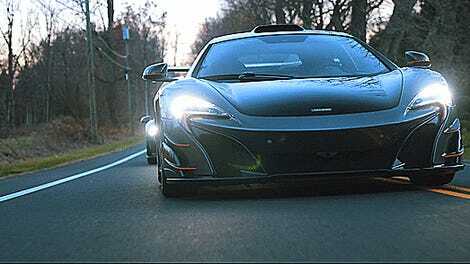 That McLaren is a road car. It just looks like a race car. Just kidding. The McLaren left your crossover in the dust before you could finish that thought, so we’re here to finish it for you. 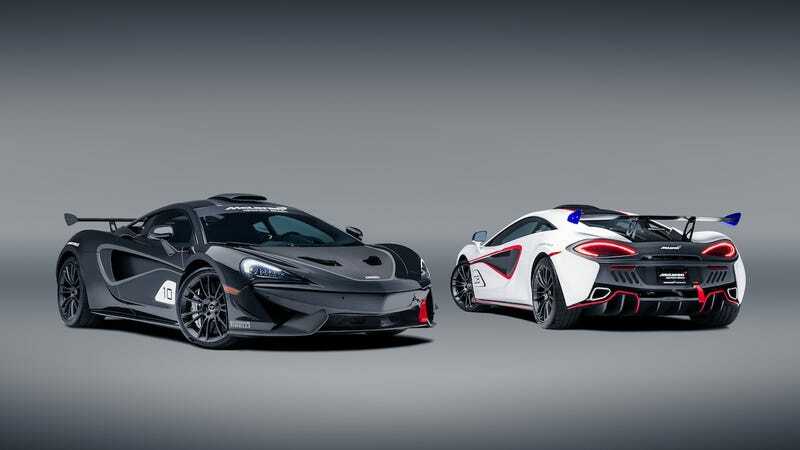 McLaren’s Special Operations division, which sounds like a secret spy bureau but is really just a place that enjoys bragging about all of the expensive custom vehicles it makes, announced that it delivered a new line of cars recently. The line was made up of 10 McLaren 570S coupes, built to look like 570S GT4 race cars but not be 570S GT4 race cars—kind of like the people who wear workout clothes everywhere but don’t actually do that whole “working out” thing. McLaren said the cars are “designed and engineered with race car emulation as the primary focus,” but are still road legal. That means buyers get cars that look like 570S GT4 race cars in liveries of 1990s McLaren F1 GTR endurance cars, along with a huge wing to add more than 220 pounds of downforce for those all-important trips across town (or to an actual track). A fully functional ‘goose neck’ carbon fibre roof snorkel for enhanced induction airflow, inspired by the 1997 F1 GTR Longtail, additionally delivers a unique cockpit sound. The transformation is completed by the inclusion of front dive planes, an MSO Titanium Super Sports Exhaust, Pirelli P ZERO™ CORSA tyres and a 570S GT4-style bonnet with specially constructed air intakes that work in conjunction with the roof snorkel and rear wing as a complete MSO aerodynamic package. Extensive use of satin finish carbon fibre across the entire bodywork, including roof, bonnet, side skirts and engine cover, as well as a unique rear bumper with ‘cut-outs’, helps to reduce weight. McLaren designed the cars so that they’d be able to be driven on public roads on the way to a track day, so there’s helmet storage space and the ability to hook up a six-point harness along with parking sensors, backup cameras and “race air conditioning” on every car. McLaren didn’t say anything about price. So, what McLaren’s saying here is that it made two handfuls of road cars that look like race cars but aren’t actually race cars, but the reason they aren’t race cars is so that owners can drive them to the race track. Road-legal custom race cars: an idea that sounds totally normal until you write it down and read it back to yourself.